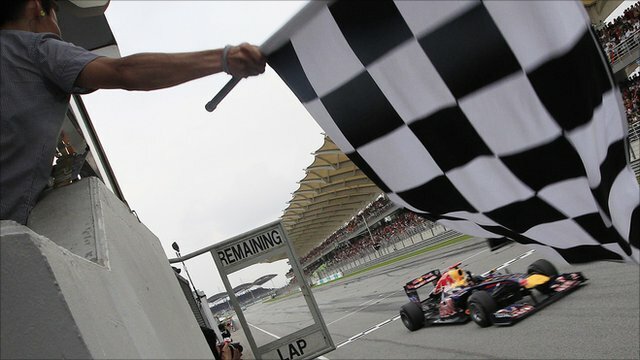 Red Bull's Sebastian Vettel was in a class of his own as the world champion won a dramatic Malaysian Grand Prix. McLaren's Jenson Button was runner-up to go second in the championship and Renault's Nick Heidfeld was third. Lewis Hamilton and Fernando Alonso were penalised after clashing on track while disputing third place. Hamilton dropped to eighth but Alonso kept sixth spot. Scot Paul di Resta picked up his second point with 10th for Force India behind Michael Schumacher's Mercedes. Vettel ran a sensible race, handling his tyres well on Sepang's blistering circuit and coping with intermittent use of the Kers power-boost system in the second half of the race. The German comfortably collected the 12th grand prix win of his career to stretch his championship lead to 24 points. "The fight behind him is close but Vettel has such an advantage out front in the championship now," said BBC commentator Martin Brundle. "It was a tremendous effort from Button and Heidfeld but can anyone stop Vettel from dominating grand prix racing at the moment?" Vettel added: "We could control it, but it was never easy. When Jenson was behind me I could control the gap. "Kers was a little bit on-off during the race. Two weeks ago [when he won in Australia] we never raced it at all. "Today if I didn't have it at the start the race would never have unfolded as it did. Then we had a problem and had to turn it off, but it came back on again." It was Button who ultimately came out on top as he collected his first podium of the season to kick start his championship charge. He said: "It was a really confusing race in a way, understanding the pit-stops and wondering if it was worth looking after the tyres. "The last stint, on the prime tyre, the car came alive and there was so much more grip. "I had the team telling me to back off and look after the tyres, but in the racer's mind you always want to attack. "If you try to preserve them by backing off then sometimes you make the situation worse: if you back off, you can lose downforce and that damages the tyres a lot more [because the car is sliding around due to lack of downforce]." Alonso was the architect of his own downfall when he tried to pass Hamilton for the final podium place with 10 laps left. The Spaniard clipped Hamilton's right-rear tyre and lost some of his front wing as he attempted to pass his former McLaren team-mate. A stewards' investigation into the incident later found Hamilton of making more than one change of direction in his attempt to defend from Alonso, while the Ferrari man was charged with causing a collision. Both drivers had 20 seconds docked from their overall race time but only Hamilton lost position as a result. The McLaren driver dropped one place to eighth and Sauber's Kamui Kobayashi moved up to seventh. Hamilton retained his third place in the championship but is now level on 22 points with Red Bull's Mark Webber. "It was close and the rear wing didn't work in the last part of the race so I could not overtake [into Turn One]," the Spaniard said. 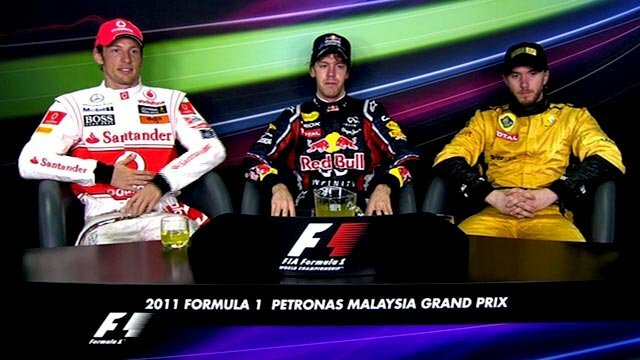 "It maybe cost me a podium." But he was encouraged by his strong pace in the race after struggling in practice and qualifying. "Today we were fighting with the McLarens and Webber - and that was a surprise for us," Alonso said. Alonso was forced into a fourth stop for a new nose and finished sixth overall but he still managed to finish ahead of Hamilton, who was struggling with excessive tyre wear for much of the race. Heidfeld easily passed him to take his first podium since the 2009 Malaysian Grand Prix before Mark Webber followed suit to take fourth place for Red Bull and complete his own comeback from a dreadful start. "This is racing, I guess," Hamilton said dejectedly. "I started second and did everything I could to keep up and I don't really have too much to say. "It started [when] I got stuck behind Heidfeld, I had Jenson on my inside and Heidfeld on my outside so squashed into Turn One. "It was difficult to defend without hitting them but that's racing sometimes. "Through the race, my tyres went off, we boxed [pitted] too early, that made us box earlier again, all the time we were boxing early. "My tyres were done on the end. I have to take it on the chin and see how it goes." The race pattern was set at the start, when the Renaults surprised the pack by coming round the outside and Heidfeld displaced Hamilton as he moved up to second, while team-mate Vitaly Petrov also gained three places. "The start was very crucial," Vettel said. 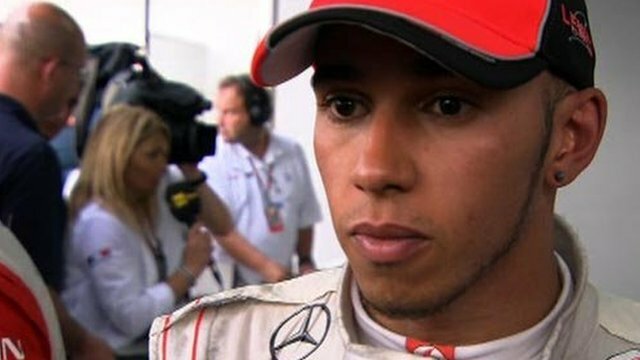 "I thought I had a very good start, but then I saw Lewis coming up, and then all of a sudden I saw something black [Heidfeld's Renault] in my mirrors! That was a good thing to happen to me for my first stint." For the second race running, Alonso got caught up in the scramble and saw his team-mate Felipe Massa sail past him. Massa had his own work cut out during the race defending his position and the Brazilian did well to collect sixth ahead of the recovering Alonso. Webber had to run the entire race without Kers - which he later admitted was a major disadvantage - and he was the biggest loser at the start as he found himself 10th at the end of the first lap. The Australian, who arrived in Malaysia desperate to return the second Red Bull to the sharp end of the field, dug in and moved forward with a four-stop strategy, passing Massa right at the last, to claim a hard-won fourth place. "Webber was just swamped into the run down to the first corner," explained BBC analyst David Coulthard. "It's a great comeback." Di Resta was beaming after he passed Nico Rosberg on his way to 10th place and had a go at Schumacher, who finished ninth, in the second Mercedes. "I'm quite happy, I must say," said Di Resta. "I knew it would be too tough to keep Michael behind us. "We have to be confident that in China we can be battling cars that are a bit faster." Petrov had another lively race but retired late on when he misjudged his return to the track after running wide. He bounced over a kerb, the car took off, and as it slammed back down on to the track the steering column broke, and the car careered uncontrollably into a polystyrene marker board. There was further disappointment for Williams with Rubens Barrichello and Pastor Maldonado both failing to finish for the second race running. The team are hopeful that planned upgrades for China will turn around their fortunes. The 24 drivers will re-enter the fray in just five days' time for Friday practice in Shanghai for next weekend's Chinese Grand Prix.